A drive to recruit more male primary teachers in England is being launched by the Training and Development Agency for Schools. The TDA is trying to redress the gender imbalance in the profession at primary school level. It has carried out research which suggests 83% of parents would like to see more men in primary teaching. Currently just 15.7% of all primary school teachers in England are men. The TDA is to form an advisory panel of current male primary teachers to consider how to attract more men to teach at primary level. The TDA survey, which questioned 1000 parents of primary age children, suggests one in four parents are concerned that their children do not have enough interaction with male teachers. And almost two thirds - 61% - said they believed male teachers had a crucial role to play in helping children feel more confident with men. More than a quarter of parents - 26% - worry that their children will lack a male perspective on life, according to the survey's findings, and 22% say they are concerned their children do not have enough contact with positive male figures of authority. Almost half of pupils aged between 5 and 11 (47%) do not have any contact with male teachers, the survey suggests. Graham Holley, TDA executive director, said: "Teaching is now a popular career choice for graduates, which is excellent news for schools. "But it is vital that teachers are representative of the communities they teach." "We need more men to become primary school teachers to redress the current gender imbalance and our aim is that the new advisory panel will help up achieve this goal." Chief executive of the Teacher Support Network charity, Patrick Nash, said the organisation often heard from men who were the only male teacher in their school. "These men feel a sense of isolation and find it hard to talk to female colleagues about certain issues or admit they are having difficulties at work," he said. They may also face problems related to discipline, if they were always deemed the best person to deal with badly-behaved boys, he added. According to the Department for Education and Skills, 15.7% of primary school teachers in England are male - 26,200 teachers, compared with 141,000 female primary teachers. 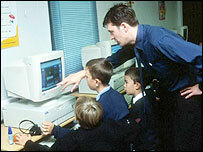 In 1998, the then Secretary of State for Education, Estelle Morris, said more male teachers would help improve the performance of boys in school. But subsequent research by Brunel University cast doubt on that assumption. In 2003, the agency - then called the Teacher Training Agency - made a similar appeal. Figures from the TDA show a steady increase in the numbers of men beginning training to become primary school teachers in recent years. In 2004-05, there were 1976 trainees, up from 1565 in 2001-02. I'm not sure if there even was a male teacher when I was in primary school, and it doesn't seem to have worried or affected me in the slightest. I'm guessing that if there is anything behind these concerns, it's more a lack of male role models. So many thanks to my dad for always being there for me. Perhaps the government should quit messing around with the education system (please, for once), and start to concern themselves with society as a whole. I am a male primary school teacher. I have had many parents approach me at the beginning of each school year and express their happiness that their child is being taught by a male teacher. Many children do not have male role models in their lives and I fully support the drive to recruit more male teachers. I have worked in four schools. This school is the only one where I have not been the only male member of staff! As a primary school governor I, of course, believe that teachers should be appointed on merit, not gender. However, our children's experiences of male teachers are extremely positive. At our school there is a male head teacher and two other teachers in Key Stage 2, one on a management grade. Not only are they wonderful teachers, but it is true that there are some issues boys feel more comfortable discussing with male teachers.